Lindabury, McCormick, Estabrook & Cooper, The Branna Agency and Selective Insurance Company hosts this complimentary seminar providing guidance on the usage of EPLI and internal controls to mitigate claims in the era of #MeToo and #TimesUp. Who is covered by your policy and who are potential claimants? Members of Lindabury’s Labor & Employment practice group address business owners, nonprofit directors and human resource professionals who are continually challenged by complying with new laws, adjusting to new trends and finding quality employees as they manage their organization. This conference will help attendees navigate the curves in the ever changing area of human resource practices. To register click for this complimentary breakfast seminar click here. Lindabury’s Cybersecurity & Data Privacy practice group co-chair, Eric Levine is presenting to attendees at The Bar Foundation of Union County’s upcoming seminar; “On the Ground and in the Cloud: Cyber Security in Real Estate Transactions”. Eric is addressing legal issues related to real estate transactions in the current cyber-climate. Lindabury’s Cybersecurity & Data Privacy practice group co-chair, Eric Levine, is among a panel of speakers at NJ NAIOP’s “Building a Better NJ: Future Proof Your Buildings”. Eric’s panel is addressing legal issues related to leasing, insurance and liability in the current cyber-climate. For more information or to register for this informative program click here. Business owners, nonprofit directors and human resource professionals are continually challenged by complying with new laws, adjusting to new trends and finding quality employees as they manage their organization. 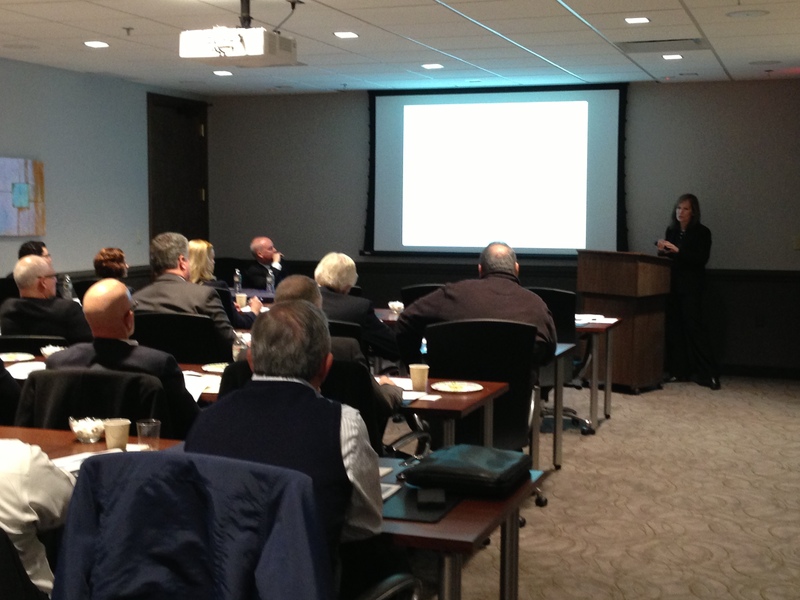 Elizabeth E. Manzo addresses members of the New Jersey Subcontractors Association on the medical and recreational uses of marijuana that New Jersey’s Sub-Contractors need to know. The status of and requirements under New Jersey’s medical and (proposed) recreational marijuana laws. What should be done if an employee presents a medical marijuana card? Can zero tolerance drug testing policies be enforced? What are the consequences of failure to accommodate a qualified medical marijuana user? Can an employee be terminated for “recreational” use during non-working hours off premises? Cybersecurity & Data Privacy practice co-chairs, Eric Levine and Robert Anderson provide insight as to the most important things a business can do to reduce their risk should a cyberbreach occur. Businesses have a major need to assess their own cybersecurity risks, and to openly exchange internal information within the company to effectively address and mitigate an actual breach situation. One of the most important things to do is to regularly conduct an investigation to understand what the business’ cybersecurity defense weaknesses and vulnerabilities may be. Critical to any counsel working to prevent a cyber-attack or respond to a successful cyber intrusion is an understanding why and how to properly utilize both attorney-client and work-product privilege. The overriding principle of using privilege is straightforward: to protect your organizations investigation and breach response efforts from usage by third parties or regulatory agencies in litigation arising from a breach. While remote access allows for greater efficiency by providing offsite employees access your network, it also increases the risk of cyber intrusion. Businesses providing remote access must understand how to safely implement these programs. Learn about remote access policies including BYOD (bring you own device) and “least privilege”, utilizing remote desktops and how to create hard to crack passwords. Presented by Robert Anderson, Lindabury’s Cybersecurity & Data Privacy Practice Group Co-Chair, and John Kalli, CEO of Trinity Worldwide Technologies, LLC. This seminar takes a hands-on, practical approach for compliance with New Jersey’s new impending paid sick leave requirements, and eight other leave laws. Kathleen Connelly is among panelists who will explain the laws, how they interact, and provide tips on updates needed to your existing policies, to avoid lawsuits, penalties, and fines. Elizabeth Manzo addresses issues employers may face when considering local and federal rules concerning medical marijuana and the failure to accommodate a qualified medical marijuana user for disability discrimination at the Gateway Warehouse Association’s 2nd Quarterly Meeting. On May 2, 2018, Governor Murphy signed New Jersey’s first state-wide paid sick leave act into law, pre-empting all local ordinances in favor of uniform paid sick leave requirements. The act becomes effective on October 29, 2018. Employment law attorneys, John Schmidt and Kathleen Connelly will provide guidance as to how to prepare now to ensure your policies and practices are compliant with the Act. Cybersecurity & Data Privacy practice group Co-Chair, Robert Anderson, has been invited as a panel member to speak at the 2018 NJBIA Cybersecurity Summit. NJBIA’s Annual Cyber Summit is the forum for technology leaders and business executives who are seeking the latest tools, information and insights to unlock real value and help their business grow. Bob will discuss how a business can minimize their cyber-risks of remote employees. While remote access allows for greater workforce efficiency it also increases vulnerability to cyber intrusion. Businesses providing remote access need to understand how to implement these programs safely. Understanding that employees often are the first and best line of defense against cyber criminals, the role that effective and regular cybersecurity training plays in protecting businesses from attack will be discussed. Nicole A. Kobis, a family law attorney with Lindabury, McCormick, Estabrook & Cooper, P.C., will be honored as a Rising Star Recipient at this year’s United Way of Greater Union County’s Annual Celebration. For more information on the UWGUC event or to purchase tickets, please visit The United Way of Greater Union County’s website or contact Melanie McLaurin at 908.353.7171, ext. 104. Mandatory statewide paid sick leave and a new law requiring employers to actively justify differences in salaries are just two of issues that will affect your workplace this year. Lindabury’s Employment Law practice group leader, John Schmidt is speaking at this NJBIA seminar which will provide a roadmap for complying with these new laws and understanding what’s on the horizon for other hot topics like immigration and I-9 compliance. Real-life case studies and overviews of recent court decisions will be provided to protect you from lawsuits, fines, and other costly mistakes. Every June, over 150 attorneys attend NJICLE’s Annual Hot Tips in Labor and Employment Law Seminar at the New Jersey Law Center to hear some of New Jersey’s leading labor and employment practitioners share practical “hot tips”about techniques they use to successfully handle employment matters. Lindabury’s Labor & Employment practice group co-chair, John Schmidt, will be speaking again at this year’s seminar on the topic of New Jersey Conscientious Employee Protection Act (CEPA). For more information or to register for this seminar click here. Elizabeth Manzo is speaking at the Metro Women’s Leadership Summit on June 1, 2018 in Newark, NJ, on the topic of marijuana. This session highlights insightful and not to be missed discussion about one of the hottest topics in New Jersey. Learn everything about the state’s marijuana legislation, employment concerns, and cannabis industry. Elizabeth Manzo is among panel of speakers invited by The Bar Foundation of Union County discussing issues concerning Elder Law and Trusts & Estates. Elizabeth addresses medical marijuana issues impacting the elderly and disabled. The status and existing conflict between state and federal marijuana laws. What New Jersey’s Compassionate Use Medical Marijuana law provides. Problems which exist between federal funding under Medicaid/Medicare and N.J. nursing home residents who seek qualified medical marijuana care. Recent lawsuits requiring accommodation for medical marijuana users under state disability statutes. For additional information or to register click here. Internal investigations by employers into allegations of unlawful harassment and other workplace misconduct are becoming more common. The practice of conducting workplace investigations is often the best way to avoid litigation, as employees who feel their employers have heard their complaints and taken appropriate action are typically less likely to seek redress in court. Employment attorneys, Kathleen Connelly and Lisa Gingeleskie provide guidance as to how effective workplace investigations can play a crucial role in developing a comprehensive defense against potential claims of liability. 05/01/2018 Medical Marijuana Laws - How Are They Impacting The Mechanical Contractor? Zero tolerance drug testing policies for apprentices. Consequences due to failure to accommodate a qualified medical marijuana user. What should be done if an apprentice or employee presents a medical marijuana card? Can an apprentice be terminated for “recreational” use during non-working hours off premises? In the ongoing backlash against sexual misconduct in the workplace signified by #MeToo, every business is reminded of the importance of protecting itself against the unthinkable: a sudden reputation crisis that could cause lasting – or even fatal – damage. The misconduct of a single employee, sexual or otherwise, can unleash a frenzy of public outrage that will test the leadership and communication skills of even the most seasoned executives. An unanticipated crisis can hit at any time. No organization is immune. Join Lindabury employment law partner, Kathleen Connelly, as she joins Jon Goldberg, founder and Chief Reputation Architect of Reputation Architects Inc., as a panelist to explain how legal counsel and PR counsel can work together to manage the best possible outcomes in the event of a crisis at your company. Andy Gibbs, a member of Lindabury’s Cybersecurity & Data Privacy practice group will be presenting to the Union County Bar Association members on the topic of Law Firm Cybersecurity. He will be joined by Scott Clark, Lindabury’s Director of Information Technology and Rob Kleeger of Digital4nx. Preparedness– Recognizing the type(s) of data your company collects and maintains is instrumental when determining the organization’s legal obligations once a cyber breach takes place. Employee Training– An effective cybersecurity training program is designed around the concept that everyone has a role to play in protecting a firm’s assets, and no role is more important than any other. Insurance Coverage– A complete understanding of a firm’s insurance program is key to maximizing protection against cyber risk. Firms should assess the various cyber risks facing their organizations, review the adequacy of existing insurance policies, analyze and compare alternative insurance products, and negotiate cyber insurance policy placements. Common Types of Cyber Attacks – Learn how to identify them and how to avoid them. For more information or to learn how to register please contact our office directly. Elizabeth Manzo addresses members of the Linden Industrial Association regarding medical marijuana, the proposed legislation regarding recreational marijuana and the resulting impact on businesses. Eric Levine, Co-Chair of Lindabury’s Cybersecurity & Data Privacy practice group addresses leading security professionals at ASIS International’s Northern New Jersey Chapter XIII, monthly meeting. Labor and Employment practice group chair, John H. Schmidt, Jr. will be speaking at New Jersey Institute of Continuing Education’s Labor and Employment Law Forum 2018. 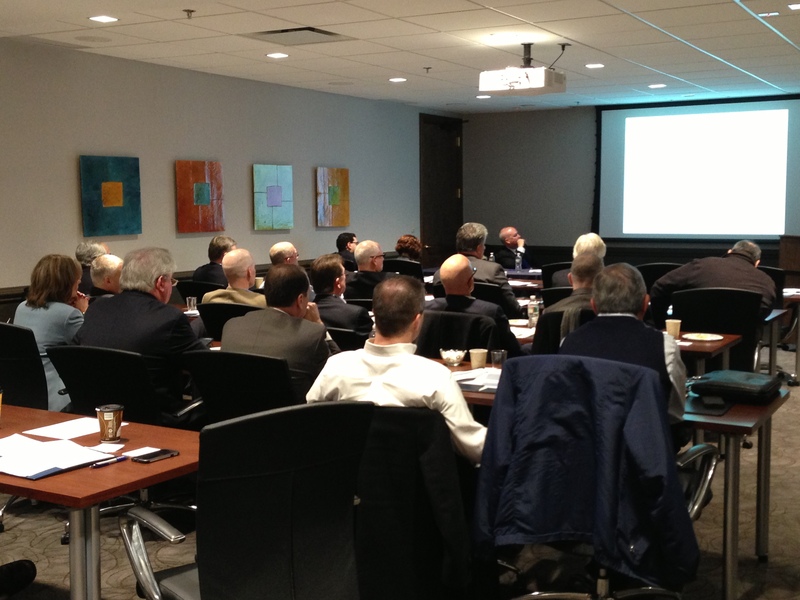 This program is well attended by many of New Jersey’s most active L&E attorneys. John will be addressing recent developments regarding Restrictive Covenants. Attendees will receive practical, useful information that can be put into practice immediately. For more information or to register for this informative seminar which has been approved for NJ, NY and PA CLE credits click here. The #MeToo movement has unleashed claims of workplace sexual harassment across all industries and shows no signs of fading with the New Year. Employees have found their voices as a result of #MeToo and employers can expect an uptick in allegations of sexual harassment in the workplace. However, many employers’ anti-harassment programs are outdated, or worse, non-existent. To further complicate matters, many employers are unaware of the actions they must take to avail themselves of critical legal defenses in the event of a charge of workplace harassment. Join Kathleen Connelly, a seasoned attorney with over 25 years of investigating and defending claims of sexual harassment, for an informative webinar discussion of how the #MeToo era will affect your workplace and what actions you can take in order to prevent harassment claims. To view this recent NJBIA webinar click here. 01/17/2018 #MeToo - Don't Make it #YouToo! It seems that the dawn of each new day brings with it new allegations of improper sexual misconduct. Accusations have not been isolated to a specific industry, as celebrities, media personalities, government officials and business leaders have all been thrust into the public discussion of what is and what is not acceptable workplace behavior. Employers need to appreciate that heightened awareness of workplace harassment has created an environment ripe for claims of sexual harassment against the company, its executives and managers. Allegations, even if unfounded or proven false, can be devastating to a business and cause lasting irreparable harm. It doesn’t take a well-known or high profile figure to destroy your company’s engaged workforce, public image and client relationships. Join Lindabury’s Labor & Employment Group on January 17th, for a discussion that will arm you with the tools you need to prevent harassing behavior in your organization. A panel of insurance claims experts, including Lindabury’s Andy Gibbs, examines the current state of adjusting and disaster response, and how the new claims tools are performing. Click here to view highlights from this recent webinar. Lindabury shareholder, James Estabrook, is among panelists invited by the New Jersey Business and Industry Association to discuss potential legal pitfalls and provide suggestions for how to avoid or mitigate your personal liability when making employment decisions. To register for this NJBIA event, click here. Lindabury’s Andy Gibbs is among panelists for A.M. Best and Best’s Insurance Professionals & Claims Resource webinar in which adjusters and other claims professionals will examine the claims response to recent storms, including the role of drones, sensors, new data sources and other tools to gather data, investigate cases and adjust claims. The webinar also looks at related regulatory, legal and privacy issues. Kenneth Cook, EagleView Technologies, Inc.; Ed Bowman, The Cumberland Insurance Group; Brooks DeMio, AmeriClaim; and Best’s Insurance Professionals Managing Editor John Czuba will help moderate the discussion, along with Senior Associate Editor John Weber. Click here to view this recent webinar. Together with Gateway Regional Chamber of Commerce we will provide an informative session allowing you to learn the legal ways to ensure your company’s continued success by avoiding lawsuits and common mistakes that can cost you time and money and negatively affect employee morale. Our panel of employment attorneys will provide practical information that can be implemented in your organization. Jersey’s “Ban the Box” regulations? Lisa Gingeleskie of Lindabury’s Employment Law group. Join Lindabury attorneys for an afternoon of educational programming designed to enhance your understanding of legal issues impacting New Jersey’s business community. Participants can earn up to 4 continuing professional education (CPE) credits. Robert Anderson, co-chair of Lindabury’s Cybersecurity & Data Privacy Group, has been invited to participate as a panelist at Union County’s “Ask the Experts” event. “Ask the Experts” is a panel discussion lead by successful, knowledgeable professionals who share their knowledge with business people and entrepreneurs. Mr. Anderson will answer business owners’ questions concerning cybersecurity dangers and protections, buying and selling a business, and corporate law matters. Understanding and managing cyber risks have become top priority for leaders in business and government. Now more than ever, a cyber attack is an omnipresent threat, requiring organizations to fully appreciate the risks and the steps needed to mitigate them. Eric Levine, Esq. and other industry experts share their views on the latest technological trends and weigh in on the issues that businesses are facing in cybersecurity. Lindabury, McCormick’s Cybersecurity and Data Privacy Practice partner Eric Levine will be a panelist for the New Jersey Business and Industry Association’s 2017 Cybersecurity Summit on April 21,2017. This seminar will present real-life case studies and a discussion of pressing issues in cybersecurity. IT managers, C-Suite and business owners will benefit from learning the damaging impact of cyber-attacks. In addition, overviews of recent state and federal legislation will be offered in an effort to protect employers from future lawsuits and other costly mistakes. Attendees will leave with resources to handle breaches and action steps to better prepare themselves against digital threats. Lindabury’s Ross R. Anzaldi attended the America Needs You NJ Cocktail Party and Live Auction to provide transformative mentorship and intensive career development to ambitious first-generation college students. Each student receives support of mentor coaches who help the students to set goals and stay on track academically and professionally. Lindabury’s Jay Lavroff recently participated as a panelist on a webinar hosted by A.M. Best and Best’s Insurance Professionals & Claims Resource. The topic of the webinar was the legal complexities of construction liability. Building is up across the nation, but jobs have gotten more complex with more of the work being outsourced and compartmentalized. That’s led to a mesh of claims and cross-claims involving subcontractors, engineering firms, consulting firms and others. A panel of industry experts will discuss where the complexity is arising, how to head off misunderstandings and what court decisions are saying about the future of construction liability. This fast-paced half day seminar covers all of the stages in an employee’s career: recruitment, interviewing, setting the employment terms, performance issues, termination, and transition. Learn the legal ways to ensure your company’s continued success by avoiding lawsuits and common mistakes that can cost you time and money and affect employee morale. David Pierce will present information at the National Business Institute’s seminar on Partnership and Shareholder disputes. This seminar is billed as a complete guide to ownership conflicts in family-owned and closely-held businesses. David will present information in two sections of this day-long program. The program will begin with David’s outline of when and how disagreements become legal disputes. The program will conclude with his discussion of resolving disputes and what winning can look like. You can register to attend this seminar here. Lindabury, McCormick, Estabrook and Cooper’s Construction Practice Leader Greg K. Vitali, Esq. will present to the New Jersey Subcontractors Association along with Brian Reingold, CPA , Partner in the Construction Services Group at Wiss & Company, LLP. Lindabury’s Employment Group Chairperson, John H. Schmidt, Jr. will present information on the soon to be enacted Department of Labor employee classification and overtime rules for the New Jersey Business and Industry Association. This half-day seminar offers comprehensive information on new federal overtime requirements, legally using independent contractors, properly classifying employees, and maintaining clear and accurate wage records. Practical information will also be provided on how to deal with unauthorized work, business trips, commuting time, and a host of other issues. *This activity has been approved for 3.50 (HR (General)) recertification credit hours toward California, GPHR, HRBP, HRMP, PHR, and SPHR recertification through the HR Certification Institute. 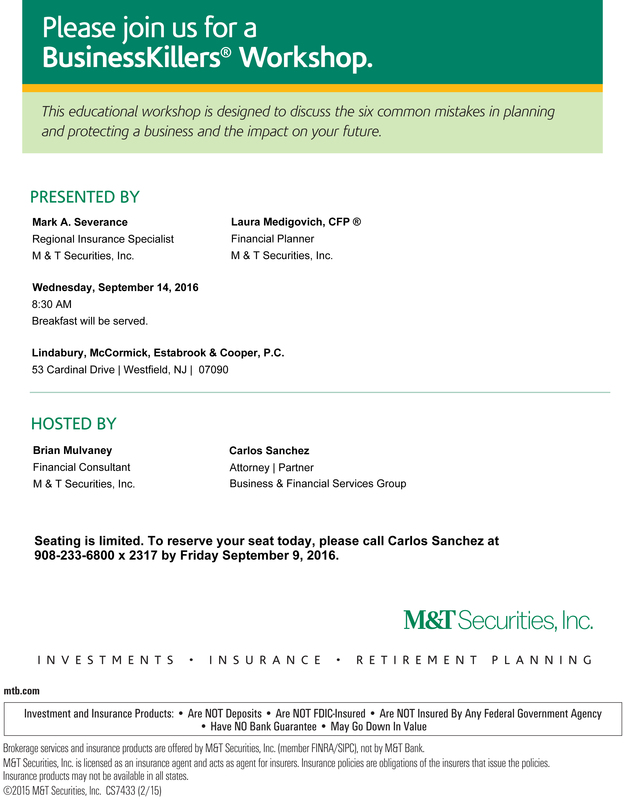 Join Corporate partner Michelle Monte and Dominick Macaro from Volk Insurance as they present information on best practices for those who are seeking to start a business in New Jersey. 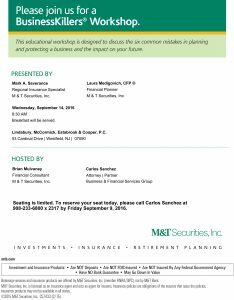 Join Lindabury and M&T Bank for a 1-hour seminar geared to existing small business owners that will discuss commonly made mistakes that can kill a business. Join Monica Vir as she presents information on estate planning and charitable giving. Monica’s presentation will address estate planning & charitable giving through the use of charitable IRAs and other planning tools. Attendees will leave with an understanding as to how these variouys planning tools can help individuals provide for their families and favorite charities. Join Lindabury McCormick’s Employment Law Group as they provide insight for employers on their responsibilities when it comes to employee leave and benefit rights. Also to be discussed will be the proper steps to be taken by employers as they investigate and respond to claims of harassment and discrimination in the workplace. This complimentary breakfast seminar is suited for business owners, office managers, human resources personnel and others responsible for the recruitment, selection, hiring, discipline and termination of employees and staff. This seminar has been approved for 2 General HR recertification credit hours by the HR Certification Institute. Registration, breakfast and networking begins at 8:00AM and the educational program will start promptly at 8:30AM. There will be time for audience questions at the conclusion of the program. On Saturday March 19, 2016 Labor and Employment group Co-Chair, John Schmidt will serve as the moderator of a New Jersey Institute for Continuing Legal Education (NJICLE) seminar focused on restrictive covenants and non-compete agreements. This program has been approved by the Board on Continuing Legal Education of the Supreme Court of New Jersey for 3.3 hours of total CLE credit. Of these, 3.3 qualify as hours of credit toward certification in civil trial law. Labor and Employment group Co-Chair, John Schmidt will be a presenter at the 2016 Labor and Employment Law Forum hosted by the New Jersey Institute for Continuing Legal Education (NJICLE). John will serve as a panelist during the session discussing Technology Issues in Employment Litigation. As an attorney representing management in employment litigation matters, John will present information from the perspective of defense counsel. Every year, over 200 “L&E” attorneys register for NJICLE’s Labor and Employment Law Forum, making it one of the most popularly attended seminars in this area of law. This program has been approved by the Board on Continuing Legal Education of the Supreme Court of New Jersey for 6.7 hours of total CLE credit. Of these, 1.0 qualify as hours of credit for ethics/professionalism, and 6.7 qualify as hours of credit toward certification in civil trial law. The goal of most business owners is to build up the company and sell it when the time is right. Entrepreneurs and family owned companies ready to expand their business, or begin its change of control or sale, need to ensure the process runs smoothly so as not to disrupt current operations. Wrong choices at the onset can lead to difficult negotiations, tax disadvantages and deals that do not close. If your company is considering buying or selling, it’s important to understand the differences between the transaction structures available. Join Lindabury McCormick’s Mergers & Acquisitions Group as they provide insight to business owners, investors, brokers, executives, and other entrepreneurs on important tips and topics of interest covering business deals, contract strategies and investment growth. Registration and networking starts at 8:30AM and the educational program will begin promptly at 9:00AM. There will be a 15-minute break midway through the program as well as ample time for all attendees to pose questions to the presenters. Construction practice leader Greg Vitali will be the presenter at the Professional Women in Construction’s New Jersey Chapter’s Breakfast Education Meeting on Wednesday February 24, 2016. The seminar, “Liens, Bonds, Contract Disputes & Resolutions” will provide attendees with tips and strategies they can employ to protect their investment when disputes arise in a construction project. Join Lindabury McCormick’s Employment Law Group as they provide insight for employers on how to handle hiring, firing, and accommodating their employees. NJ’s Final ‘Ban the Box’ Rules – What Can Employers Ask About an Applicant’s Criminal History? When is it Time For an Employment Contract? Registration and networking starts at 8:00AM and the educational program will begin promptly at 8:30AM. There will be a 15 minute break midway through the program as well as ample time for all attendees to pose questions to the presenters. On December 2, 2015, Employment litigation attorney Steven Backfisch will participate in an Employment Seminar hosted by the New Jersey Business and Industry Association. The NJBIA program is titled, “Documentation, Discipline & Discharge” and is designed to help employers manage the disciplining of their workforces legally and effectively. Steve will share insights from his 30 year career by providing specific examples of steps business owners and their managers can take when documenting, disciplining and in some instances discharging, problem employees. Bankruptcy practitioners often face issues and questions involving other practice areas. To effectively represent clients, Bankruptcy lawyers need a working knowledge of these other practice areas to understand how they will impact the outcome of their bankruptcy cases. Lindabury Bankruptcy & Creditors’ Rights attorney Scott Pyfer will participate as a panelist in a NJICLE Seminar on October 29, 2015. Scott, along with an assembled group of practitioners, will provide the bankruptcy attorneys with the knowledge they need in order to spot issues raised by other areas of practice. The seminar will first examine non-bankruptcy practice areas of most concern to attorneys who primarily represent individual consumer debtors in chapter 7 cases and will then explore those issues most likely to be encountered by attorneys who primarily represent businesses reorganizing under chapter 11. Register here to attend this seminar. Kathleen M. Connelly of Lindabury’s Employment group will be a featured speaker at the NJ YMCA State Alliance Human Resource Networking training event at the Fanwood-Scotch Plains YMCA on Friday, October 16, 2015. Kathleen’s presentation will focus on changes to the White Collar Overtime Exemptions under the Fair Labor Standards Act. Litigation partner Philip Pizzuto is participating in a Continuing Legal Education seminar hosted by the New York State Trial Lawyers Institute. This seminar is focused on assisting attorneys who already have expertise in negotiation tactics but who want to better understand the how and why of the process. This seminar will feature a mock mediation so as to highlight strategies and techniques. Mr. Pizzuto has been recently appointed by, and serves at the pleasure of, the New York State Superintendent of Insurance, as a New York State No-Fault Arbitrator in cases filed with the American Arbitration Association. He has over 18 years of experience in all aspects of civil tort litigation and has extensive litigation and trial experience in both state and federal courts. Sergio D. Simões will be presenting at the NJBIA Employment Seminar, ” New Supervisor Training,” on Friday, June 26, 2015 at the Forsgate Country Club. Sergio will speak on ” Reasonable Accommodations in the Workplace. ” To read more about Sergio, please click here. Are your policies compliant in age of increased NLRB oversight and enforcement? The Capital Hilton, Washington D.C. In today’s uncertain economic times a business often finds itself making difficult operating decisions. Half day seminar dives deep into what employers can do in hiring decisions. Elder Law Attorney to speak to Alumni Group. HOT TOPICS—IF YOU CAN’T TAKE THE HEAT, STAY OUT OF HR! On Thursday, October 16, 2014, Elizabeth Engert Manzo will be presenting to the Garwood Senior Citizens Club on New Jersey Elder Law & Estate Planning. This seminar will take place at the Garwood Fire Department, 403 South Avenue, Garwood, NJ from 11:30 a.m. – 1:00 p.m.
How Much Info to Share with Your Employees? On July 19, 2014, Lindabury attorney Monica Vir presented a seminar to the church leadership of St. Paul Baptist Church concerning Training and Tax Guidance for Churches to Comply with IRC Section 501(c)(3). The seminar took place in Montclair, NJ from 9:00 a.m. – 11:00 a.m. To read more about Lindabury’ s nonprofit practice group, please click here. 06/10/2014 Do I Really Need an Employee Handbook? Lindabury attorneys recently served as mock trial judges for the initial rounds of the 2014 Vincent J. Apruzzese Mock Trial Competition. Attorney presented in front of the Summit area AARP. 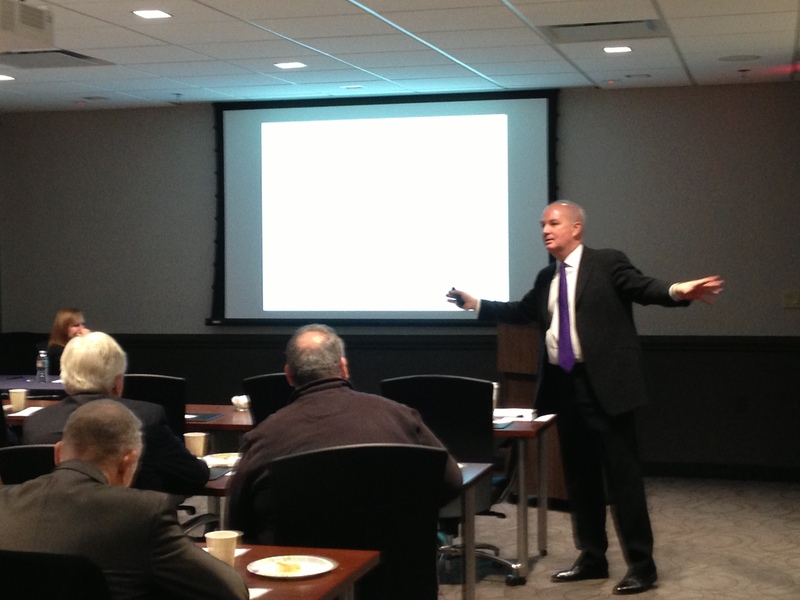 Lindabury Attorney Speaks to the New Jersey Licensed Private Investigators Association. Lindabury attorneys served as mock trial judges for the initial rounds of the 2013 Vincent J. Apruzzese Mock Trial Competition. On September 26, 2012, in perhaps the most significant New Jersey environmental decision in the last thirty years, the New Jersey Supreme Court in New Jersey Department of Environmental Protection v. Dimant dealt a major blow to the NJDEP’s strategy of pursuing business owners for cleanup costs under New Jersey’s Spill Compensation and Control Act without sufficient evidence linking those businesses to the contamination and alleged damage at issue. On Wednesday, November 28 at 12:00-1:00 p.m., Jerry English participated in a roundtable webinar to discuss this recent decision, its implications for future cleanup efforts, and the burden of proving causation that the decision imposes.